Published November 11, 2016 By Anna T. This post may contain affiliate links. Regardless, I only recommend sites I've researched and/or used and trust. Do you like the idea of doing customer service work from home? Then you might want to think about applying to Working Solutions! This is one company that it seems many home-based workers only have good things to say about. Working Solutions works with global clients, with calls handled in the United States. Working Solutions hires independent contractors to work as home-agents providing sales, technical support and customer service for their clients. The company has been in business for quite some time now and regularly have phone-based work from home openings available. How much does Working Solutions pay? Home-agents earn anywhere from $9.00 -$30.00 per hour, depending on the program. How and when does Working Solutions pay? Working Solutions pays via paper check or direct deposit, your choice. They pay twice monthly on receipt of your invoice. How do you apply to Working Solutions? You'll have to fill out an application online and then follow that up with an online test. After you've tested, someone will manually look over your results and you may or may not get an interview. The interview process could take place online, over the phone, or both. After your interview, you'll have to wait to see if you're “in.” Unfortunately, there doesn't seem to be any rhyme or reason to how long this takes. Some people hear back very quickly while others don't hear back for up to a few months. Project availability isn't guaranteed upon your acceptance to the workforce. However, once you've signed up to a project, you can begin training and get to work! It might take a while to hear back, but it's important not to apply more than once. It's possible to log in and update your application at any time once it's in their system. 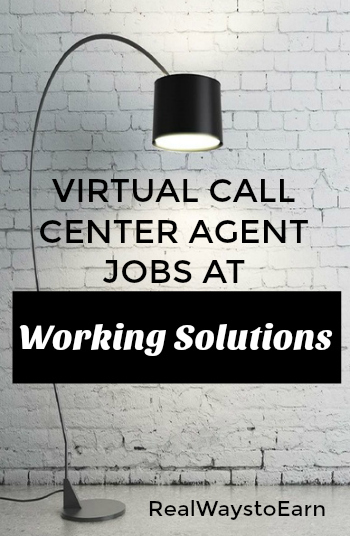 What Working Solutions Call Center Agents Do? Being a home agent for Working Solutions means taking calls, placing calls, chatting online, possibly doing data entry, typing emails, and all kinds of other things. However, the work you will do will depend entirely on what projects you've signed up to work on. Keep in mind that with phone work, you will need a quiet environment — this means no kids yelling, dogs barking, etc., so if you're doing phone work for Working Solutions, make sure you're doing it when these distractions are not a problem. You can also see this post I created with some other work at home jobs where background noise is not an issue. The company allows you to work on multiple projects. Working Solutions encourages their workers to actively participate in more than one project at a time if possible, but you cannot get additional projects until you've put in at least 40 hours of time on a previous project. You are also expected to schedule yourself for what hours you can work and stick to your commitments. Different projects have different hourly availability, and from what I can tell there IS a weekly minimum of hours you need to try to get in per week, but that number varies from project to project. The duration of time you have to be on a program to get paid training will vary depending on the program. Are there any benefits offered with this work-at-home opportunity? Working Solutions hires you as an Independent Contractor, which means you are not technically an employee — so no benefits. Does Working Solutions hire people outside the United States? Working Solutions is able to contract with individuals outside of the U.S., however, opportunities are much more limited due to increased telecommunications costs to route calls. Anyone is certainly welcome to apply and the company will be in touch as soon as there is a suitable opportunity. Does Working Solutions have a referral program? If you're an agent for Working Solutions, you have the opportunity to be paid for referring other agents to Working Solutions. I'm not clear on the amount, but if you apply and were referred by another agent, you should list their name on your application so they can receive compensation for referring you. Is Working Solutions a good company to work for? I have no personal experience with Working Solutions, BUT the feedback I've read online has been mostly positive. Their agents say they are a great company to work for, and it seems that many people really want a job here. Some have been waiting for a long time to be hired. How do you apply at Working Solutions? … And if you've made up your mind and want to go ahead and get your application in, you can browse available jobs and apply for them here. P.S. – Looking for more work at home call center jobs? I created a massive list of over 150 work at home call center companies you may want to browse. You can also sign up as a member to FlexJobs (a job search site I pay for personally) and see what companies have work at home openings now. Good luck! The pay is extremely fair, your schedule is extremely flexible, and in the 10+ years that I have been working from home I have never found a company with better training, better organization, and better support for their agents. This is a fantastic company to work for. For me personally, I like that I’m not micromanaged. I was given more than sufficient training, ongoing education, and a clear understanding of what is expected of me from day to day that I can log in and do my job and just receive the weekly QA feedback. However in chat, there is always opportunity to discuss the projects, there are always resources available to answer questions, an educational site to review policies, procedures, and any updates, there are several people that are available to schedule one on one ongoing support. Scheduling hours is challenging on some of their projects, especially if you don’t want to work a lot of evening and weekend hours but the hours are usually there for those who are willing to work, albeit maybe not the most desirable hours. I highly recommend this company. . I just applied and got an email right away saying that I made it to the next step in the process. Any idea how long this takes? I applied just recently and got an email telling me I wasn’t a good fit for the company, I guess because I applied for non phone work only, they say they hire if you need phone work exclusively but that’s just not so, I have little ones, and I know background noise is going to be prevalent, I wish I would of not applied yet and would of waited til I either found someone to watch my kids, not put them in daycare, why would I put them in daycare if I’m at home. Had I known they only hire for phone work only that’s what I would of applied for. Btw can I reapply and if so how long do I have to wait?? They have a very bad habit of hiring too many people on a project which leaves you scrambling to find hours, They are probably still surviving on the reputation of who and how they used to be. It’s a totally different company than it was just 5 years ago. I just want to toss out a warning about Working Solutions. As a whole, it is a fairly decent place to work through. But they do have a couple of projects that are not what anyone wants. AT&T contracts through Working Solutions. On that particular project, you are evaluated on how well the customer likes AT&T, not how well you do your job. AT&T is not always upfront with their customers, so there are many unhappy people calling and putting the blame on you. Many are under continuous threat of being fired and are forced to take almost continuous classes on your own time. Also, Working Solutions hires people onto the project as customer service agents, but in training you are told that you have sales quotas to meet each month. If you choose Working Solutions, be careful about which project you get on. Their reputation is not as good as it used to be. I got offered a job with them for a place for mom. It pays $0.25 per min. Place for Mom launched in 2000 to give seniors and their families an easier way find senior care. Compassionate Senior Living Advisors and online resources, we provide families with the knowledge needed to make informed decisions about caring for aging loved ones – moms, dads, uncles, aunts, brothers and sisters. Working Solutions agents will offer customer service and support by returning outbound calls to families who have requested information. As the program progresses, agents will begin taking inbound inquiry calls in addition to the outbound return calls. All calls will be with a direct recipient or family member, assisting with access to a local Senior Living Advisor based on specific needs of the caller. Uh, did you say $0.25 per min. ?” …. Incorrect. It is $0.20 per min. Amazing! So this must mean that they have reduced their “per min.” amount? How disgusting!! They treat you like employees as opposed to contractors and they try to micromanage you by sending you these stupid call back quality crappolas. What’s really funny is that they try and sucker you into working extra hours by offering $2 more / hour if you work between certain hours (during your off time). What a joke! They already pay minimum wage so paying a couple of dollars per hour more ONLY for certain hours is insulting. WSOL is probably the best Phone-based WAH company out there. They pay per minute.. but they also offer a “minimum” per hour, so you sometimes get paid to just sit at your desk waiting for a call. They recently took over some of the project that Convergys had, including one that I worked for Convergys on.. all I can say is they pay 3 times (yes, three times) what Convergys paid for the same job. APPLY!… and update your application often .. that’s how I finally got on with them after 3 years of trying! Just had a phone interview with a representative from Working Solutions. I wanted to update your information that they DO NOT hire for non-phone jobs. I applied under that information, but that’s not accurate. They hire for phone work only & there are times when there is non-phone work that they give out to their contractors. But, the representative said that non-phone work is few & far between & they do not hire exclusively for that. So, I would classify this as a strictly phone position. Hi, everyone. I just wanted to let you know that working solutions is currently hiring. I put in an application about 3 weeks ago and had a phone interview today. Unfortunately is was not a good match for me, but I wanted to let others know so maybe it would work out for them. I think they are mostly looking for customer service phone work with some one experienced in customer service and or sales. If you already applied and have been waiting a long time, I heard updating your application can help you get a faster response. Good luck! Thank you for the info! I’ll go share this news with the Facebook followers. Much appreciated! Thank you Anna, I wouldn’t have even known about all these opportunities if I had not discovered your blog. It has been really helpful, I applied for many jobs that I learned about here. That is great, I love to hear that! Keeping this site going is so much fun to me because I am always genuinely interested in online money-earning opportunities. Just found your blog from Angie, The Work at Home Wife. I had singed up with this company a few years ago and was offered the phone job right off out of the shoot. At the time I was already on a project with West and also had LiveOps on the back burner. I was also freelance writing, which is what I really wanted to do for this company. At the time they had an opening. The recruiter said these jobs were very limited and had a wait list a mile long. Here it is, some years later, and I have still not heard from them. I wonder if I should contact them and let them know I am still here. If it has been a few years, that might not be a bad idea. Have you logged in and updated your info with them recently? I know they say you can do that anytime after you’ve applied even if you’re not on a project. Maybe doing that would also help with alerting them that you’re still out there and interested in working, if that makes any sense. I really like your blog. It was very informational , however I still have not found a legit work at home or online site. The survey paid very little and a lot of junk mail has followed them. Do you know any other sites that have work at home oppurtunies? Please let me know. Thanks in advance. Sorry you have not been able to find what you’re looking for. You should check back here regularly as I update the blog with new opportunities on a regular basis. You didn’t state which surveys you were taking that were causing the junk mail. There are actually very few survey sites that I recommend because of this. I think the only one I have listed here is Pinecone Research, and they, to my knowledge, do not send out junk mail. If you’ll check my “Recommended” section at the top of the page, you will find several other websites that regularly list work at home jobs. I would love to do something on the side like chat, email – things of that nature but I am so unsure when companies only hire IC’s. I don’t even know where to begin when it comes to taxes! If anyone has any good reference sites about doing your taxes and what not, I love any help! The IC stuff is really easy, but if you’re worried about owing money at the end of the year you can always set a little bit aside each time you’re paid. So far, I haven’t had to pay in on anything, but I know it could happen. If you want to, I’d go ahead and apply, and then if you’re hired, you can go ask H&R Block or whoever you use for tax preparation how you should handle your taxes. I know in order to claim any earnings for taxes of whatever, you have to make more than $600. I might need to do that so I can have a back-up plan!